The GoPro HERO (2018) Hero 6 Hero 5 waterproof case is extremely durable and water resistant to 45 meters. Ideal for diving, snorkeling and other underwater activities. Screen protector and Lens protector helps to keep dust, smudges or scratches from your camera lens. 【Perfect Design】The accessories kit is specially designed for GoPro Hero (2018) Hero 6 Hero 5 Black action camera. Give your action-cam set the home that it deserves. Keeps your camera safe and sound from scratching, shock and dust. 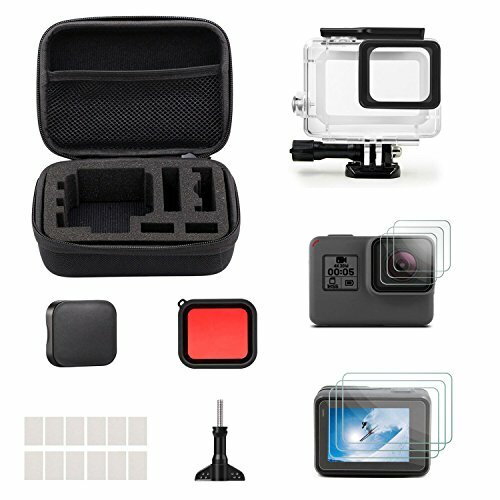 【Waterproof Housing Case】The waterproof housing case for Go Pro HERO (2018) Hero6 Hero5 is extremely durable and water resistant to 45 meters, made of high quality PMMA material. It is convenient to link camera with other accessories mount through this case. Ideal for diving, snorkeling and other underwater activities. 【Screen Protector】Made of PET material. Perfect protection of the camera's lens and screen, coming with 3 packs LCD display screen protector and 3 packs lens protector film. HD protector films safely guard against dirty, dust, smudges and scratches. 【Small Travel Case】Made of excellent EVA material with 6.2 x 4.3 x 2.5 inch dimension. Ideal for travelling and home storage. Keeps your GoPro and accessories safe, protected, and organized. If you have any questions about this product by iTrunk, contact us by completing and submitting the form below. If you are looking for a specif part number, please include it with your message.